Long hair has an intrinsic and enduring style factor that has made it popular throughout the ages. Contract to what most people think long hair can be easily maintained with regular wash and care. They can also be styled into a wide variety of hairstyles which suit casual as well as formal affairs. And for those who love their long hair but at times find it too staid and boring there is the option of long layered hairstyles to break the monotony. They can transform a simple and plain to classic and sophisticated in no time at all. Long layered hairstylesof course do more than add a dash of panache to your look. 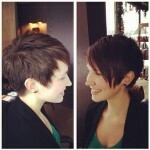 They skillfully add volume and texture to the hair which now moves with more flair than before. Though the length can remain more or less the same, the new style now frames the face accentuating the shape and fine lines, enhancing the overall looks. Long layered hairstylesare not just good for your looks but they are good for your busy schedule as well. Whether you tie it into a quick ponytail or put it up with a barrette or hair clip, it automatically falls into soft curls and layers around your face. This makes your face looks softer, stylish and sophisticated without any effort at all. Long layered hairstyles also come handy when you are running behind for an event and don’t have time to go into an elaborate style. You can do a simple chignon and let the upper layers frame your face or simple leave it down. What would have looked boring in a plain long hair before will look fabulous now. All you need to do is give it a light brush and you are good to go. They look so good that you can actually do without elaborate jewelries as well. Women who have straight hair will find it easier to adopt and maintain long layered hairstyles. Curly hair doesn’t show the layers well but then most of the time short hairstyles suit them better. Maintenance is easy. Regular washing with a high volume shampoo and a follow up with your stylist every 3 months are all that it takes to make your hair look good at all times.